If you're buying a new home, even if it's newly constructed, it's highly advisable to hire a home inspector. A home inspector will check for defects, examine houses, suggest improvements, if needed, and review plans. They inspect the roofing, full exteriors, structural elements, full interiors, plumbing, electrical, heating and air conditioning, and all other components depending on requirements. The home inspector has to be thorough when reviewing a house and plays a vital role in the purchase of a house. Based on home inspector’s detailed analysis of the house, a buyer is assured that the purchase they are going to make is a safe and sensible investment. While home inspections are essential, picking an inspector who will thoroughly examine a home and inform you about any issues with it isn’t an easy task. 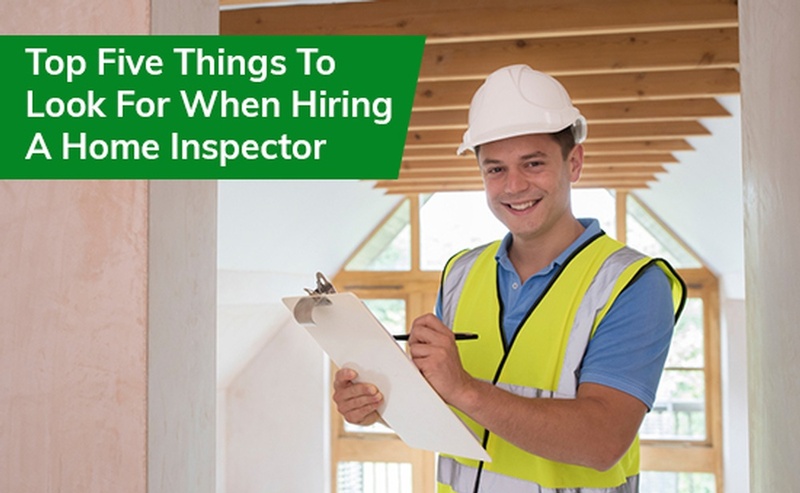 However, to simplify your search and help you select the best inspector for your home, here’s a list of the top five things to look for in a home inspector. Everyone has to start somewhere but hiring a first time home inspector might not be the best idea and lead to a job not thoroughly done. It makes sense to work with a home inspection company that has been around for some time since they would have experience and a couple of homes already inspected. The company you are working with should be connected to the right people and places. This helps when you are going through the work they have done in the past. Credible associations ensure that you are getting your information from a reliable source. Irrespective of the picture painted by an inspection company or home inspector about the work they do, always look at reviews before making a decision. Everyone finds it easier to speak on the internet, and if you see multiple disappointed clients, it’s best you carry on with your search. If there are issues with the work done, you should not be left high and dry. Double check to make sure the company you are working with is insured. There are different pricing options when working with various companies. Do not work with the cheapest one. However, that said, you should pay for the work done and not be paying for a name. Find a mix of a thorough inspector, who comes at a reasonable price. If you’re looking for a home inspector that specializes in residential home inspections in The Villages, Florida, reach out to The Village Home Inspector. We provide clients with an accurate, unbiased report on all the components of the house and send over the report as soon as the inspection is complete. To learn more about the services we offer, please click here. To get in touch with us, please click here.